Jump-start your offense with a variety of quick hitters and easy baskets in this potent version of the 4-out ball screen continuity offense! Providence Day School head coach Brian Field has created a top-tier 4-out ball screen continuity offense that emphasizes reversals and ball screens. 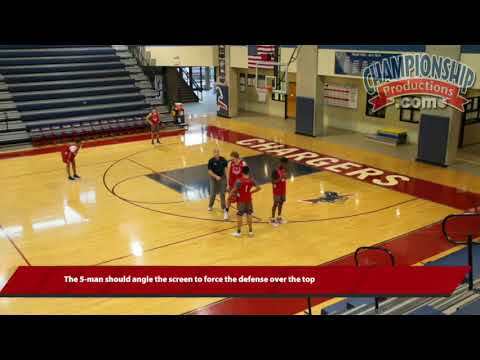 In this video, you'll learn how to implement Field's offense and see how it creates high-percentage scoring opportunities for your players by utilizing your guards' playmaking abilities while pulling defending post defenders away from the basket. With seven quick-hitter plays designed to be used within the 4-out ball screen continuity offense, your players will learn how to pick & pop, pick & roll, slip screens, set flare screens, and run dribble hand-offs - all actions that are difficult to defend. Learn the primary shooting and finishing drill used by Coach Field. He incorporates all potential shots that are taken by players when running the offense, and since the drill has multiple players getting shots up, it will lead to more reps for each player. You'll see how to run the drill on both sides of the floor with each action so you can incorporate your own philosophies into the drill. Coach Field includes seven quick-hitters that can be used when running the 4-out ball screen continuity offense. With a 4-out offense, many guards will dominate the ball. However, Field has created a way to get your best post player a chance at scoring as well. Opponents may attempt to make adjustments to guard the your ball screen continuity offense, but with several plays covered, Coach Field gives you counters for every adjustment possible. This video will help any coach looking to implement a simple, continuous offense for their team. Field does an excellent job of explaining how pieces within the offense move together to build continuity. If you're looking for an easy-to-learn offense that provides many scoring opportunities, you will want to install Coach Field's 4-out offense!